Well, I personally don't believe that people have to fall when the pastor pray for them. Take note something clearly, I did not say that I don't believe when people falling down during the anointing service but I said I don't believe people have to fall down. This is because I have seen people falling down under the anointing in our church many times. Therefore I can never deny the power of God that are working in our midst. It doesn't mean only the people who slain down receiving the anointing but even those who are standing also receiving the anointing. It is not in the hand of the servants of God for who to be filled but it depends on God on who and how He wants to fill the people. Let me ask you something, what would happen to you if you touch a high voltage electric power? For sure it will throw you down. If an electric power has the power to throw you down and even to kill you, how much more would be the Power of Almighty God who gives life to us through His Spirit? Yes! The reason people were slain in the Spirit is because of this. When God spoke from the mountain, the people could not bear to hear the voice of God which is like thunder that shatters them. How much more would be His power to us? Our flesh can never bear His power. In Acts 10, while Peter was preaching, Holy Spirit fall upon the Gentiles. How would Peter get to know that these people has been filled? It is because He sees people being filled with Supernatural power and something extraordinary took place. Instead of we questioning all this, let us be thirst to be filled and feel the power of Holy Spirit because, 'Then the Spirit of the Lord will come upon you, and (you will) be turned into another person.' 1 Samuel 10:6 . When you are filled with the power of God, you will be a different person. There will be a change within you. 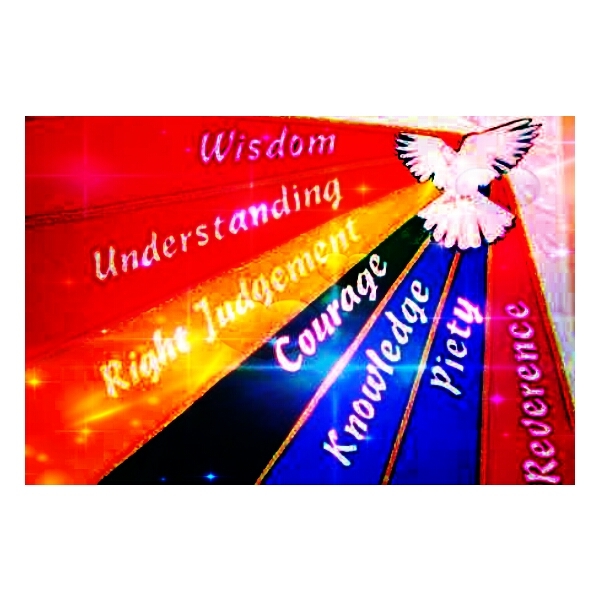 Now, let us look at the 7 gifts of the Holy Spirit. ​Wisdom is not the quoting of facts. Wisdom is a gift that allows a person to understand things from God's point of view. In other words, Wisdom allows a person to recognize truth. A person with the Gift of Wisdom is able to take this truth and use it to glorify God by choosing Godly solutions to problems. ​The Gift of Counsel is also known as a Gift of Right Judgment. Counsel, the third gift of the Holy Spirit, is the perfection of the cardinal virtue of prudence. Prudence can be practiced by anyone, but counsel is supernatural. Through this gift of the Holy Spirit, we are able to judge how best to act almost by intuition. Because of the gift of counsel, Christians need not fear to stand up for the truths of the Faith, because the Holy Spirit will guide us in defending those truths. ​The Gift of Fortitude is also known as the Gift of Courage. Through this Gift a person is no longer afraid to stand up for God and His truths. A person who has the Gift of Fortitude will stand up for good against evil and is convicted to take a stand when the occasion arises. ​The Gift of Knowledge allows a person to understand the meaning and purpose God has for him and to live up to this meaning. It differs from wisdom in that it is an action, not just a desire to live up to the ways of God. It differs from Understanding in that it is not just ability, it is a knowing. Piety, the sixth gift of the Holy Spirit, is the perfection of the virtue of religion. While we tend to think of religion today as the external elements of our faith, it really means the willingness to worship and to serve God. Piety takes that willingness beyond a sense of duty, so that we desire to worship God and to serve Him out of love, the way that we desire to honor our parents and do what they wish. ​The Gift of Fear of the Lord puts God in the proper perspective. A person with this Gift understands the greatness and awesomeness of the Lord. They want to serve Him because of who He is. A person with the Gift of Fear of the Lord understands who they are and why they are here in relationship to God; In other words, everything they are is due to the wonder, love, grace, and perfection of God. They are totally dependent on the Lord as a child is to a parent. The Gift of Fear of the Lord is the beginning of Wisdom. Once a person understands who God is and desires to please Him, they can begin to understand things from God's point of view or have Wisdom. The Holy Spirit gives us the ability to discern what comes from God and what is not of God. The Holy Spirit emphasizes performance. There is a spirit of fear and intimidation. Which is called a religious spirit. 2 Timothy tells us the Lord has not given us a spirit of fear.2 Timothy 1:7; "For God hath not given us the spirit of fear; but of power, and of love, and of a sound mind." The religious spirit can lead to controversies of legalism, criticism, debate and opinion. Guilt, fear and pride are the earmarks of these situations of contention and disagreement. We need God's grace to shine in all things. A religious spirit can cause you to linger in guilt, fear and pride. A religious spirit is a deceptive tool of the enemy. Christ is our all in all. We receive the Father when we receive Jesus. Through the Holy Spirit's guidance and the Word of God, we can discern good from evil. Because so many times evil can be mistaken for good and good mistaken for evil. (Isaiah 5:20). But we have hope in the face of evil. (Jeremiah 17:17). Keep your focus on God at all times. Meditate on the Word of God fervently and diligently on a daily basis. (Joshua 1:8). You can then discern good from evil and true doctrine from false doctrine. God's Word is your instruction for life. In Matthew 12:36, 37, Jesus taught about the importance of our speech: “Every careless word that men shall speak, they shall give an account in the day of judgement.” After observing believers in many parts of the world for more than 50 years, I am convinced that 95% of believers do not believe these words of Jesus. They do not believe that they will have to give an account to God one day for every useless word they ever spoke. That is why they continue to speak evil of others, gossip, backbite, crack filthy jokes, etc. They hurt others with their jokes too. Humour is a good thing. But humour that hurts others is not godly. You can get a reputation for humour thereby, but it is a careless word for which you will have to give an account in the day of judgement. Most people don’t believe that God has a record of every word that we have ever spoken. It is recorded in our memory. There is a video tape that has been running in our memory ever since we were born. Like a computer’s memory, it has recorded every thought, word and deed of ours. In the day of judgement, God will display all that for everyone to see. If you believe God’s Word, you will be careful with your speech. We all believe in justification by faith. That is Scriptural. But if you are a balanced Christian, you will also believe in justification by works – for that is also Scriptural. Romans 4 speaks about justification by faith. But faith without works is dead. So, James 2 speaks about justification by works – works of faith. Here in Matthew 12:37, Jesus said that we would be justified or condemned in the final day, by the words we spoke. On the day of judgement, when the words you spoke are played back from your memory, will you be justified or condemned? That is a question we must all consider now – before it is too late. In the new covenant we are to have a tongue of fire. On the day of Pentecost a tongue of fire came on people’s heads, symbolising a tongue under the permanent control of the Holy Spirit. Many Christians mistake this to refer to speaking in unknown tongues. It is more than that. It is a tongue under the control of the Holy Spirit all the time. Many speak in other tongues as led by the Spirit and then speak in their mother-tongue led by the devil. I am thankful that the Holy Spirit has given me, not only the gift of speaking in unknown languages, but above all the ability to control my speech in my known languages as well. In the old covenant they could not control their tongues, because they did not have the Holy Spirit dwelling within. But today we can live on a higher plane.